Yes, We Can Copy PowerPoint SECTIONS! PowerPoint’s Sections are not new (introduced with PowerPoint 2010), but they are very unutilized. Just this past month, the updates to PowerPoint (for Office 365 subscription version) included the ability to copy sections to another presentation, or different location in the same presentation. While there are more improvements needed to help PowerPoint Sections become a truly easy to use and helpful organization resource, this is a great improvement (and it lets us know the Microsoft Dev Teams are looking at Sections and making progress on improving them!). 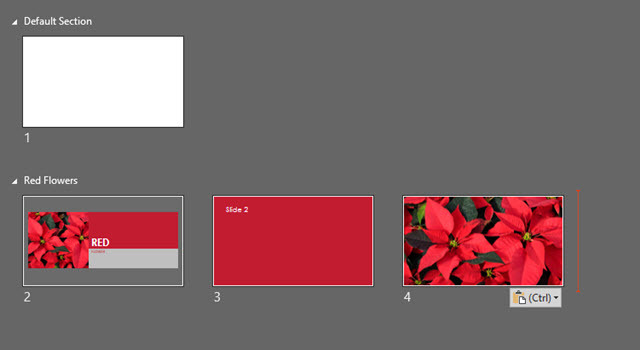 As an example, if there are sections in the deck, copying the entire section is easy. Go to other presentation (or other location in same presentation) and CTRL + V to paste in the section name and all of its slides! Here is my sample presentation with sections. 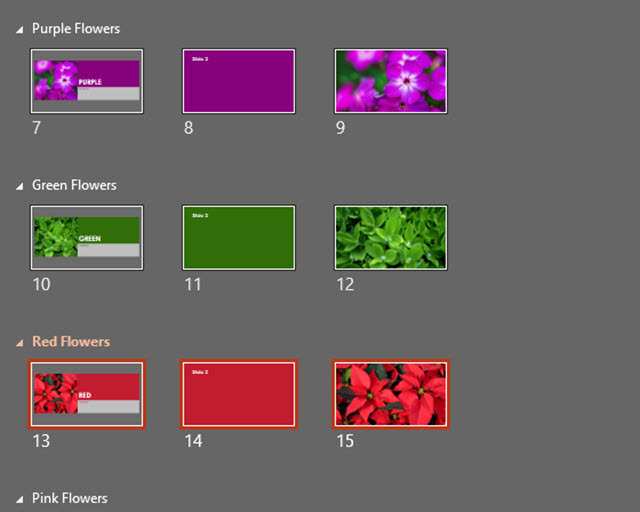 I am going to copy the RED FLOWERS section into a new presentation. Right-click dialog on a section name does not have copy or paste commands, so must use keyboard shortcuts. But you can right-click the insert location and use the standard PASTE OPTIONS in the right-click dialog. The 2016 TLC Team PowerPoint Holiday Animation! In my einvironment (Windows 7×64, Powerpoint 2016×64) pasting inserts the slides, but does not create a new section. Are you using PPT 2013/2016? Interesting. I am not certain if it is the process being used, the Windows 7 OS or the 64-bit PowerPoint. But I can confirm that when I select a section of slides (click on the section name to highlight the section name and all slides in the section), copy and then paste into a new document, all of the slides – and the section information are pasted in.